A functioning kidney from another individual is surgically transplanted into the patient and the new kidney will then take over the function of the patient’s failing kidneys. Renal transplantation is currently available in two Ministry of Health hospitals i.e. Hospital Kuala Lumpur (since 1975) and Hospital Selayang (since 2000). The patients’ abdominal peritoneum is used as the membrane to remove the waste products of the body and this is achieved by indwelling chemical fluid (dialysate) in the peritoneal space. Dialysate containing waste products are then replaced with fresh dialysate. Peritoneal dialysis has the advantages of being home based, better tolerated by patients with heart disease and better preservation of the functions of the failing kidneys compared to haemodialysis. An artificial membrane (dialyzer) is used to remove the waste products from the patient’s blood. Patients’ blood is taken out, processed and then returned back to the patients by a haemodialysis machine. It is extremely important that the planning for renal replacement therapy is done in a timely manner and should begin at least six months prior to the expected date of initiation of renal replacement therapy. Selecting the choice of the renal replacement therapy. Early planning of renal replacement therapy will enable a smooth transition from predialysis to dialysis and will avoid the need for emergency dialysis which carries a high risk of complications and mortality. Timely initiation of renal replacement therapy could also prevent the occurrence of complications associated with end-stage renal failure. The patients must be exposure to all three forms of renal replacement therapy and should be given adequate time to decide on their choice of renal replacement therapy. Adequate patient education and counselling are vital to enable patients to choose the appropriate mode of renal replacement therapy that best suit them. This is a daunting decision as it has a major impact not only on the patients themselves but to their family members, friends, colleagues, and employers. It is not uncommon for patients to change their minds on their choice of renal replacement therapy as they learn more about the various modalities of renal replacement therapy and how these therapies affect their lifestyle. In some instances, patients may not be able to have the modality of choice due to medical reasons. Patients with severe heart disease may not able to tolerate haemodialysis while peritoneal dialysis may not be suitable for patients who had undergone multiple abdominal surgeries. Patients may also start on one particular mode of renal replacement therapy and subsequently have to be converted to the other forms of renal replacement therapy due to medical, social or financial reasons. Hence, patients may take weeks to months before deciding on the mode of renal replacement therapy. Renal transplantation is the treatment of choice for end-stage renal failure as it provides better patient’s outcome and a superior quality of life1,2. However, it requires the availability of a functioning kidney from either a living or a deceased donor. Living related and spousal donors need to be evaluated extensively before the renal transplantation can be performed and this may take 3-6 months or longer.As preemptive renal transplantation (transplantation performed before the initiation of dialysis) has the best outcome and obviates the need dialysis access creation, it is important that discussion and planning for renal transplantation be done early3. Selecting peritoneal dialysisIf a patient prefers peritoneal dialysis as the mode of renal replacement therapy; early assessment of patient’s visual acuity, hand dexterity, home environment and workplace by the peritoneal dialysis team is important as this is a home based and self-care therapy. 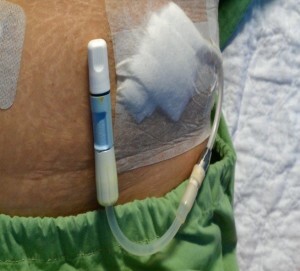 In patients who are unable to perform the peritoneal dialysis themselves, assisted peritoneal dialysis by family members may be considered.In order for the patient to perform peritoneal dialysis at home, peritoneal dialysis catheter needs to be inserted surgically into the peritoneal space (Fig 1 & 2). For the surgical wound to heal completely, the peritoneal catheter should only be used after 2 weeks3. Hence, the peritoneal dialysis (PD) catheter should be placed at least 2 weeks prior to the anticipated time of initiation of dialysis3. 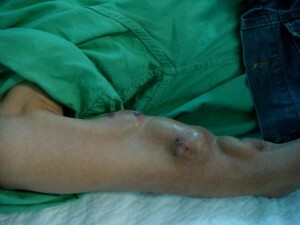 Maturation of an arteriovenous fistula usually requires at least 6 weeks but the time required for fistula maturation varies among patients3 It is not advisable to use the arteriovenous fistula within the first month after construction as premature cannulation of the fistula may result in haematoma and permanent loss of fistula3. Addresses and contact numbers of haemodialysis centres in this country are available in the National Renal Registry (NRR) and the Malaysian Society Nephrology (MSN) websites. Patients may use this website to look for haemodialysis centres that are situated near their home. There are various non-governmental organisations and religious organisations that may provide financial assistance for renal replacement therapy. However, this may differ from state to state and hence it is best to discuss this with your own nephrologist. Approval may take weeks to months and hence, patients should apply as soon as possible. Liem YS, Weimar W. Early Living-Donor Kidney Transplantation: A Review of the Associated Survival Benefit. Transplantation 2009; 87:317-318. Goldfarb-Rumyantzev A, Hurdle JF, Scandling J, et al. Duration of end-stage renal disease and kidney transplant outcome. Nephrol Dial Transplant 2005; 20:167.